I have a game engine which handles hexagon based war games and things like LOS, etc, for both flat and tip up hexes. 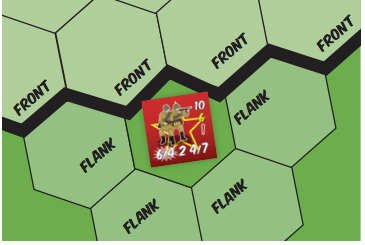 A particular game I'm implementing at the moment, Band of Brothers, has facing for vehicles and, optionally, for infantry. I represent the hexagon locations as offset coordinates, and have the values for all the dimensions of each hexagon and the endpoints of the vertices and center in relation to the overall map stored as doubles. I also convert to cube coordinates for determining distance. Just looking for ideas or pointers on how I might determine these hexagons. If your range is limited, you can enumerate all the hexagons in each category, assuming the unit is facing north and is located at 0,0. Then use hex rotation (in cube coordinates) to match the direction. And use hex addition to move the coordinates to the unit's location. 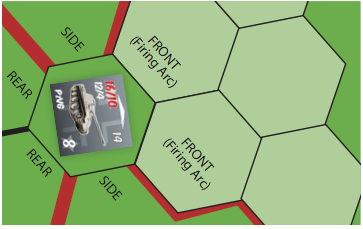 By explicitly enumerating the hexes, you can have arbitrary shapes, such as being able to fire on side positions only when 2 ≤ distance ≤ 4, or having the range depend on the angle. I put a demo here. If you have unlimited range, I think atan2 is probably the simplest thing. Use hex subtraction (in cube/axial coordinates) and then convert that to x,y and use atan2. Not the answer you're looking for? Browse other questions tagged hexagonal-grid or ask your own question. How do I rotate a structure of hexagonal tiles on a hexagonal grid?